I’m sure you know him but I want to show in my blog because I’m a big fan! 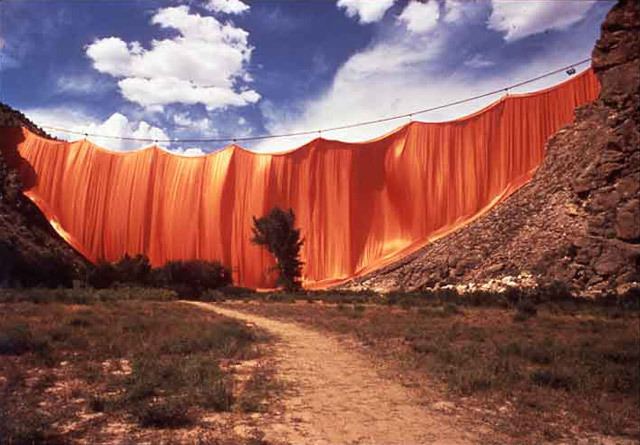 Every other week here in Colorado it seems there is news of Christo’s ongoing battle with opposition groups regarding the installation artist’s plan to drape six miles of the Arkansas River in translucent fabric. If give the green light, the installation will be in place for two weeks. But the process of making it happen has taken 21 years so far. However, it turns out that the “communication” that Christo is interested in is rather one-sided. Over at CPR, as mentioned in my last post about Chihuly, I’m working on developing a segment entitled “Yes, But Is It Art?” The aim of the series is to get a more holistic view on perceptions of art than one usually gets from hearing or reading a single critic pontificating on a particular artist, piece of work or movement. My producer and I thought that the Christo debate might make for a perfect discussion along these lines. The plan was to assemble a few experts including the artist, the lawyer who’s representing one of the main opposition groups and an academic who specializes in studying large-scale landscape art installation projects. The only trouble with the plan was that Christo refused to participate. The artist was very happy to come in and do a solo interview. ”Christo does not do group interviews, but would be happy to provide a one-on-one interview in the CPR studios,” an aide wrote to inform us. But we were told no. It’s Christo’s prerogative to remain cool and aloof from the discussion, I suppose. But this attitude does seem disingenuous to me. The artist has created an amazing sandbox here. Why won’t he come play in it nicely with others? If you argue against something being art and not being worthwhile you always sound sort of dumb, but he uses this tactic (if you don’t like his work you don’t get art) as a shield against all kinds of criticism. He obviously doesn’t want to debate because he wants to control the dialog – just the way he spends decades pushing his ideas – he likes to pressure people into seeing his art the way he insists it be seen. The battle is his performance – and this aspect of his work has always been boring. I would like it if we could just magically see the installations and the drama, noise, lawsuits and expense didn’t exist, but I don’t think Christo would like this. I just can say your comment is very intelligent. Too bad I can’t answer to you in english with the same style as yours. But you made me think better. It’s true that I always liked the idea of “packaging” and my thoughts didn’t go further. Thank you to comment m post. You opened my mind. Oh how nice – I am glad you found my comment worth a thought – this is a tough subject and people get upset about art.